For those who want to get to the professional level, please check my mentor program. The WTI OIL (now at 55.73) just topped. Closest target: the area 53-51 (theoretically, 51.24). The monthly chart reveals that the WTI OIL unfolded four major waves down (in magenta) and started major wave five downward after the top at 77. 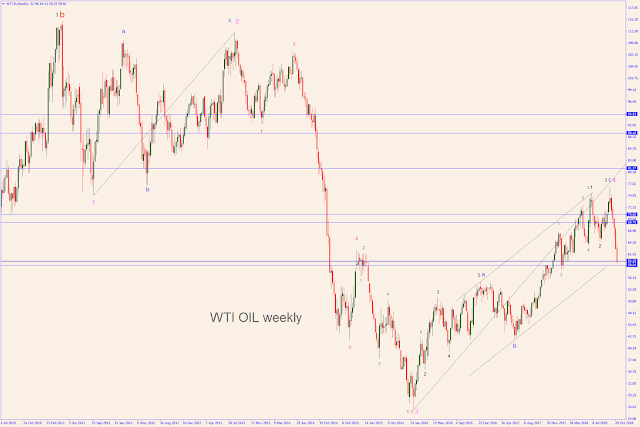 In the weekly chart, the first part of major wave five (wave 1) took the Oil down to 42.35. 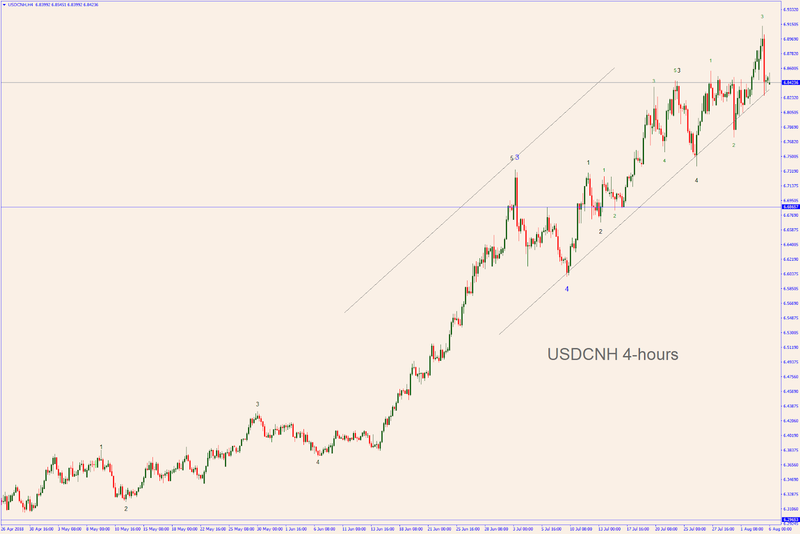 Then retraced to 57.85 (wave 2) and now seems to be heading down again by starting wave 3. The daily and 4-hours charts confirm that wave 2 was made of three waves up (as it's supposed to be). 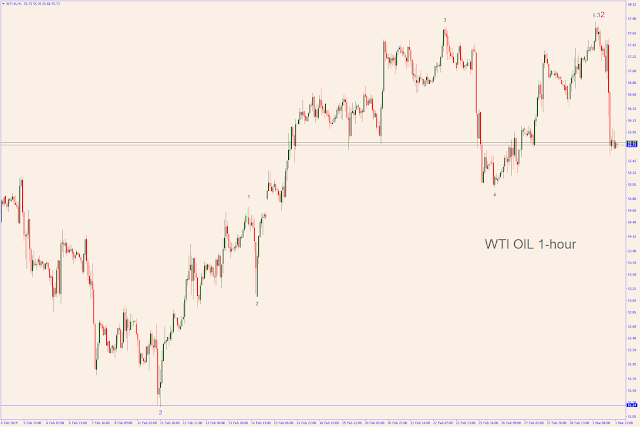 It also show a double top and reversal candlestick pattern, confirming that a top-and-reverse is in place. 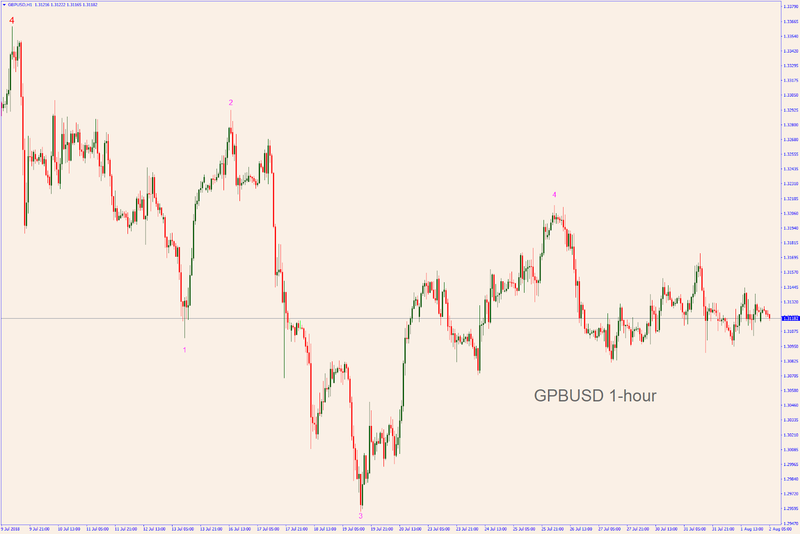 Finally, the 1-hour chart shows a "breakaway pattern", meaning that the next movement should be down. There is still the chance that (in the weekly chart) this is a temporary retracement down. 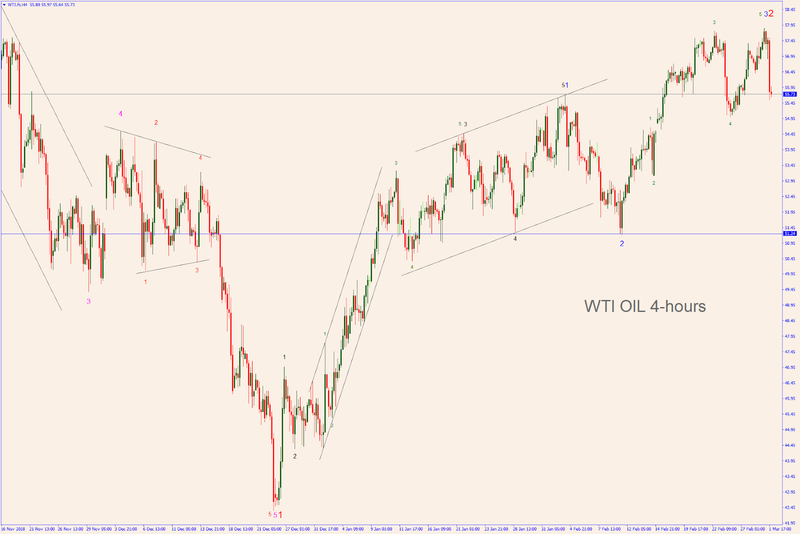 If this is the case, the OIL could be stopped by the support around 51 and reverse. 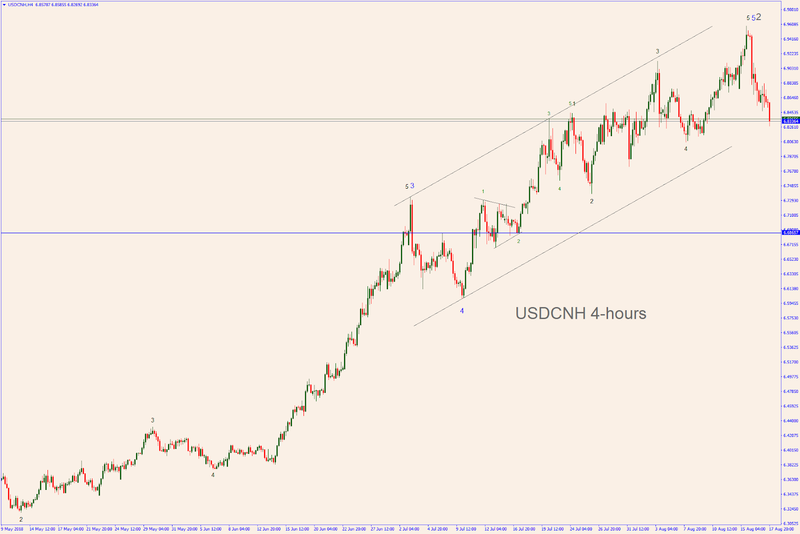 In so doing, it would make a new high anywhere between 64.80 and 93.60. Instead, if the OIL crosses that support around 51, we need to consider 26.00 as the next support. 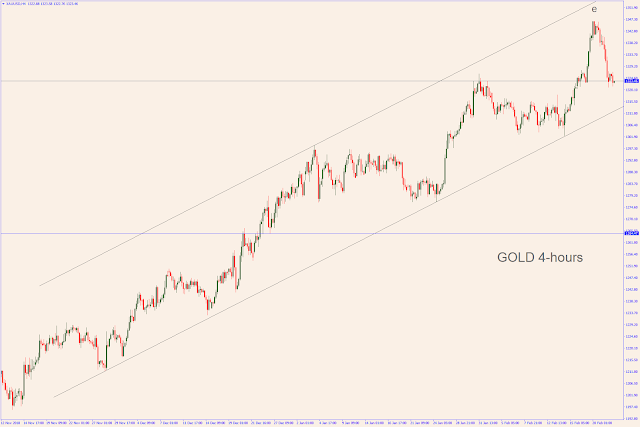 Although I thought that Gold (now at 1323) was going to top at 1333/4, it topped at 1346/7. 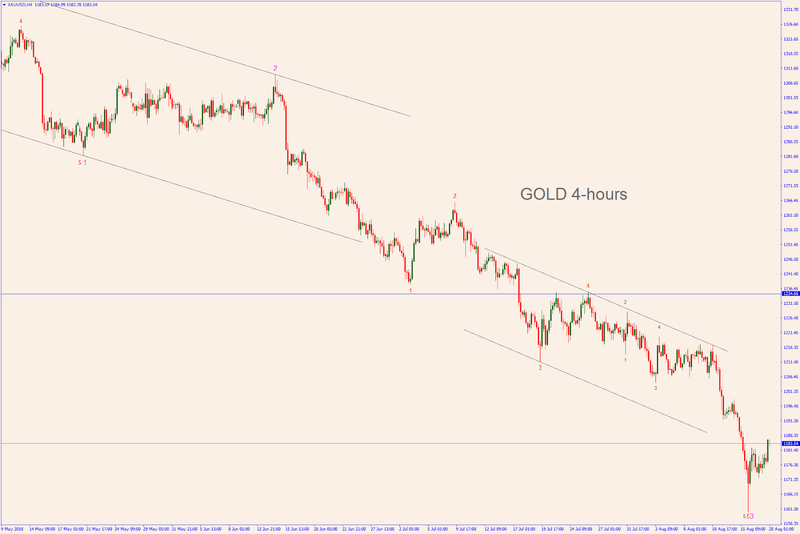 The next leg should point down, starting with the target at 1236. The monthly and weekly charts display a large wedge which is an accumulation pattern (a-b-c-d-e). 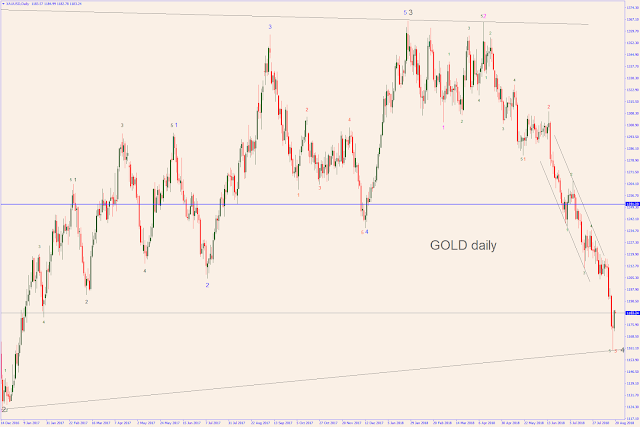 Theoretically, next large wave should tank from now on. 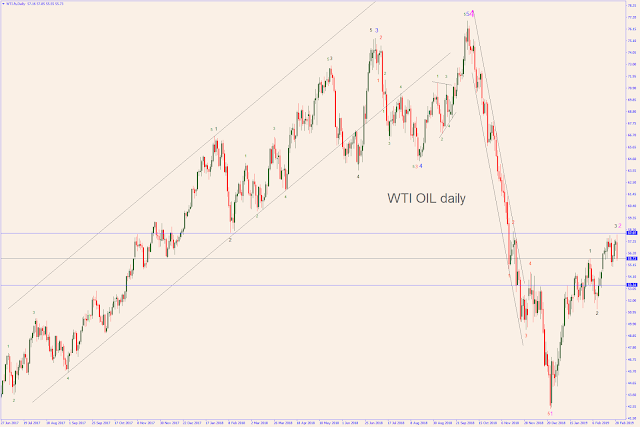 The daily chart and the weekly chart clearly show that the whole set of 5 waves up - from the bottom at d - is religiously in place. These waves formed wave e which topped right now. 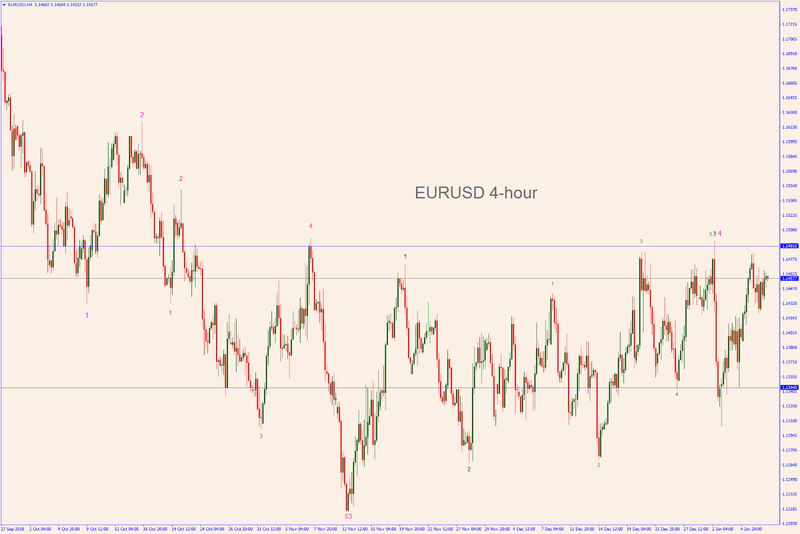 The EURO to top soon? 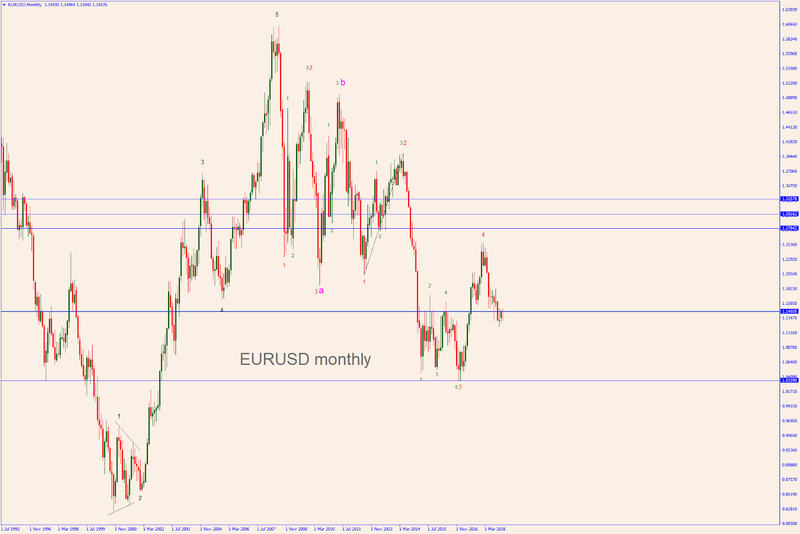 The Euro (now at 1.146) might not make it through the 1.165 resistance. Hence, it could reverse course soon to target the area around 1.1040. 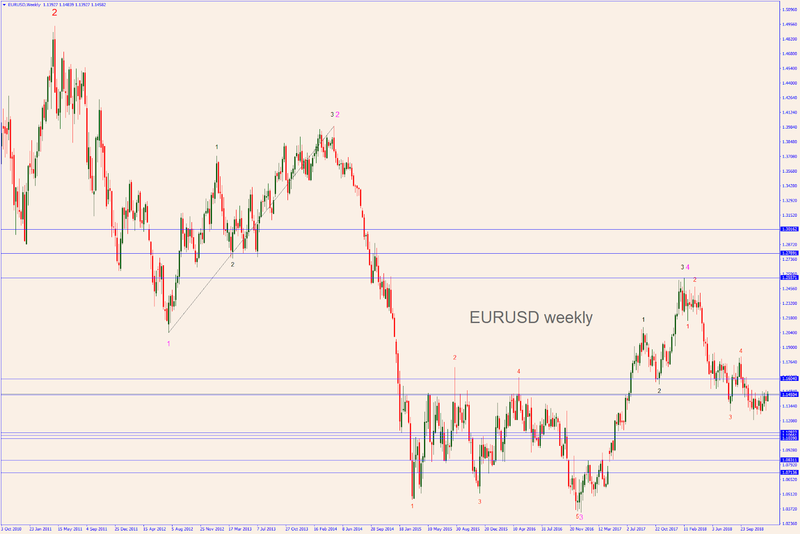 1) The Euro is performing an a-b-c retracement wave from the top at 1.6037.
fully deployed and wave five downward is already half away to 1.1040. 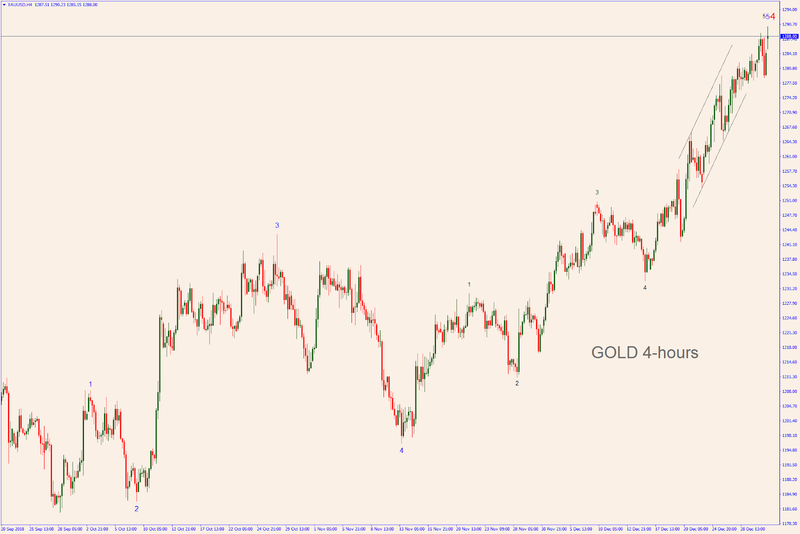 However, wave four can unfold with different shapes. 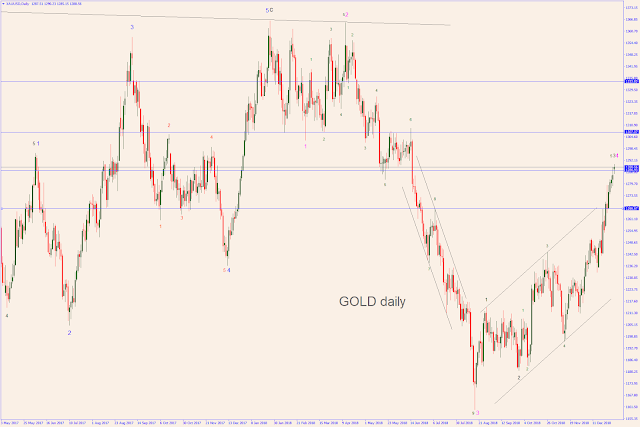 In particular, it could evolve into a much large pattern which includes a rally to 1.27-1.30 before resuming the downtrend. We'll see. 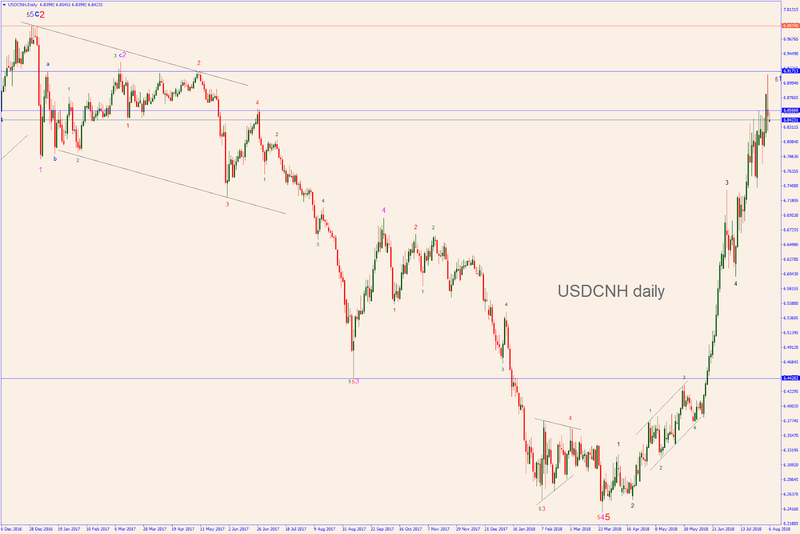 The daily and 4-hours charts show that wave 5 (from the top at 4 in magenta) is currently unfolding with 5 minor waves, 3 fully deployed and the 4th one almost complete. 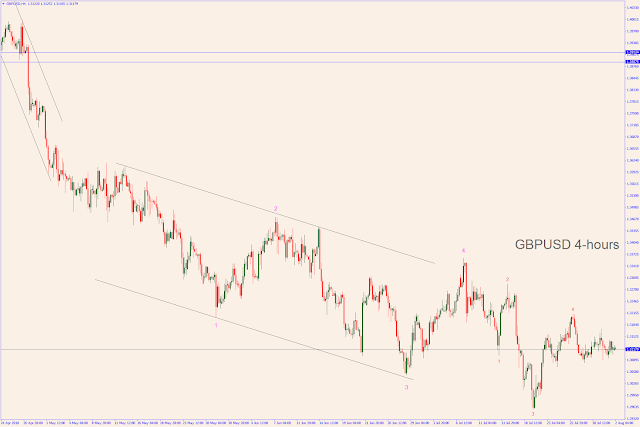 If this is the case, minor wave five could be heading to 1.104 soon. Happy New Year! This is the first newsletter of the 2019. 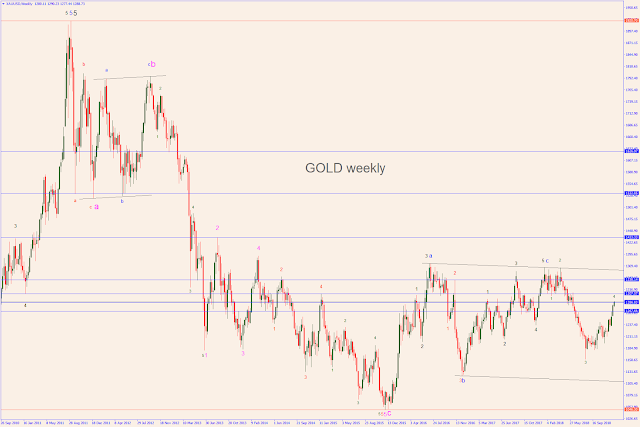 Although Gold is trying to get to the area 1300-1308 (see the target lines in the daily chart), it also shows the signs of a commodity running out of steam and it might turn South before reaching that target. 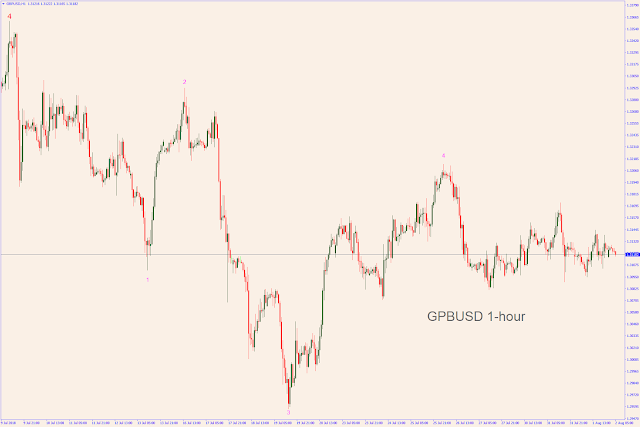 Note the exhaustion gap in the 1-hour chart. 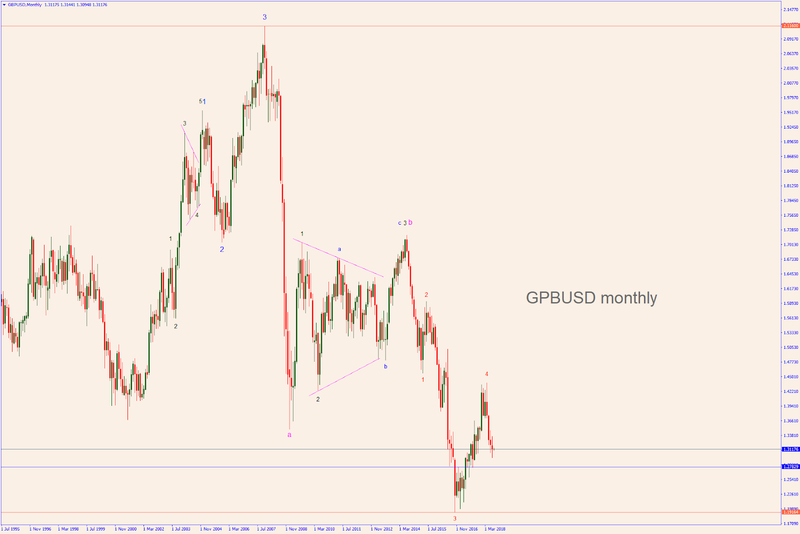 The monthly and weekly charts display a very large accumulation pattern (a-b-c). 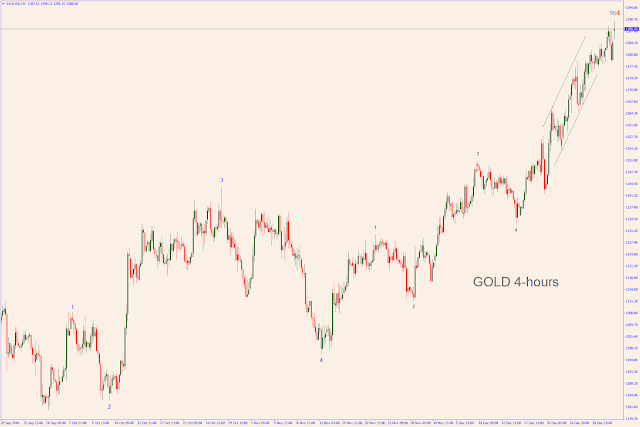 From the top at C, Gold has now staged 4 small waves downward (out of 5). 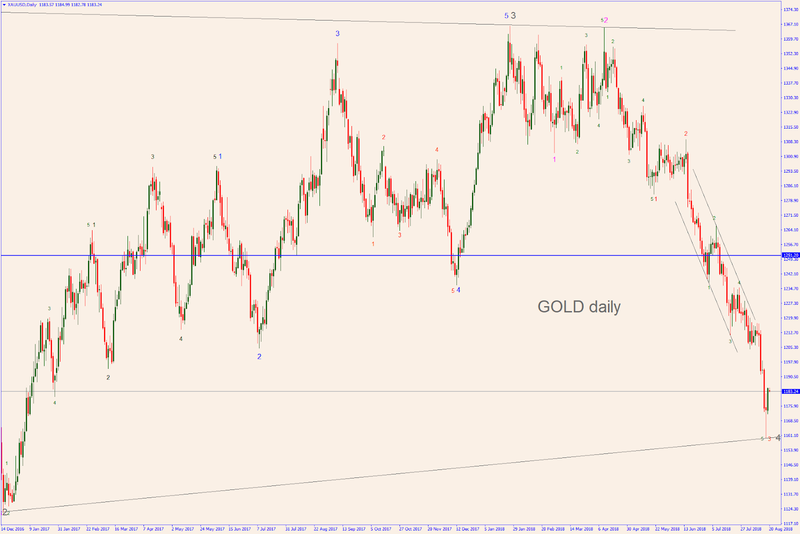 Wave 5 might take the commodity to the area 1155-1131 or even 1100. 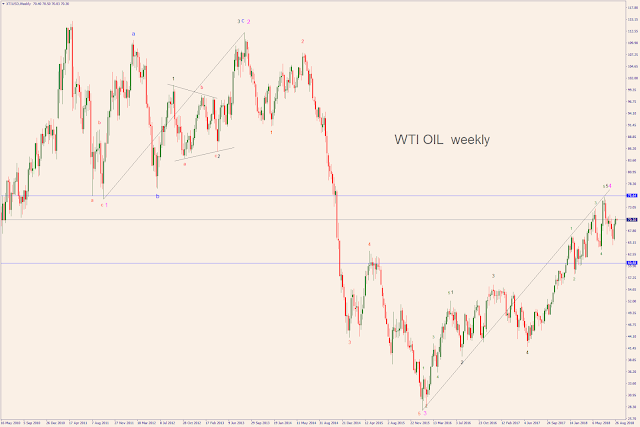 The daily chart and the weekly chart clearly show that the whole set of 4 waves down - from the top at C - is religiously in place. 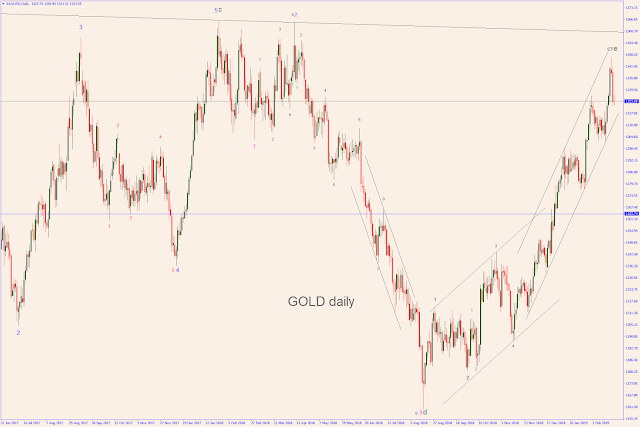 If Gold tops soon, it will mark the completion of wave 4, starting a new downtrend to be labelled wave 5. 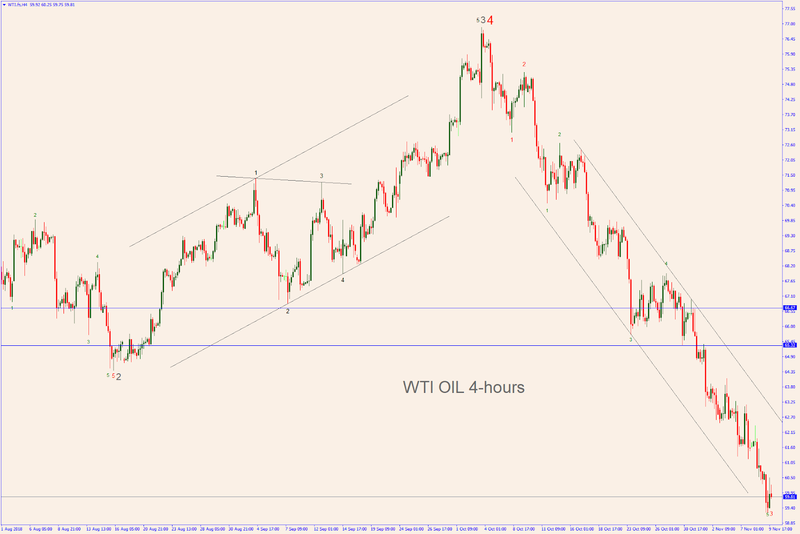 WTI OIL: end of the line? Although the WTI OIL (now at 70.34) can still edge up a bit, it might not make it higher than 72.60 and the long awaited major downturn could set in soon. Targets: the area 68-67 followed by the supports at 64-63 and 61-60. 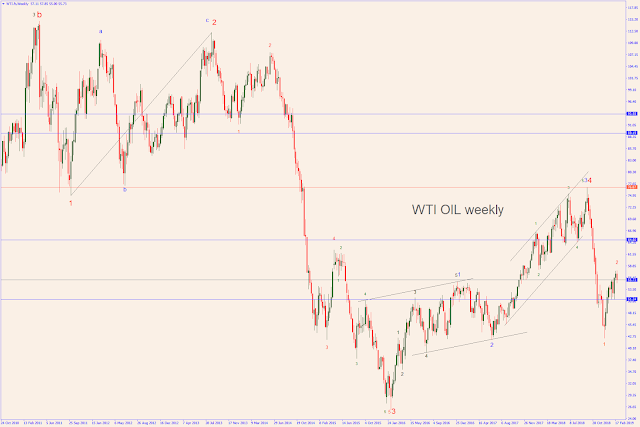 The weekly chart reveals that the inclination of wave 2 is perfectly identical to the inclination of wave 4 (see the gray lines) and this might be a indication that wave 4 just topped. Previously, wave 2 topped and reversed after touching the inclination line. 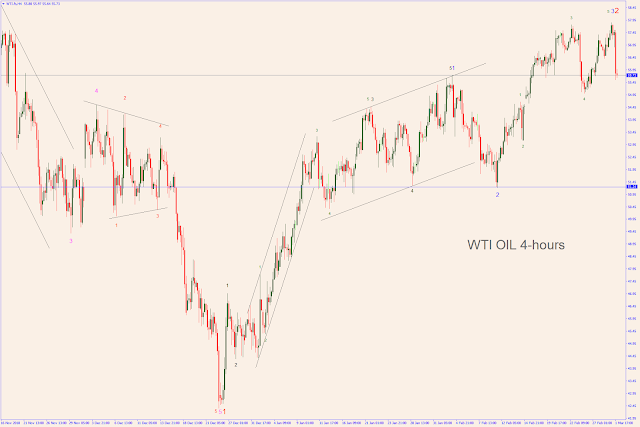 Similarly, wave 4 touched the inclination line at 75.34. 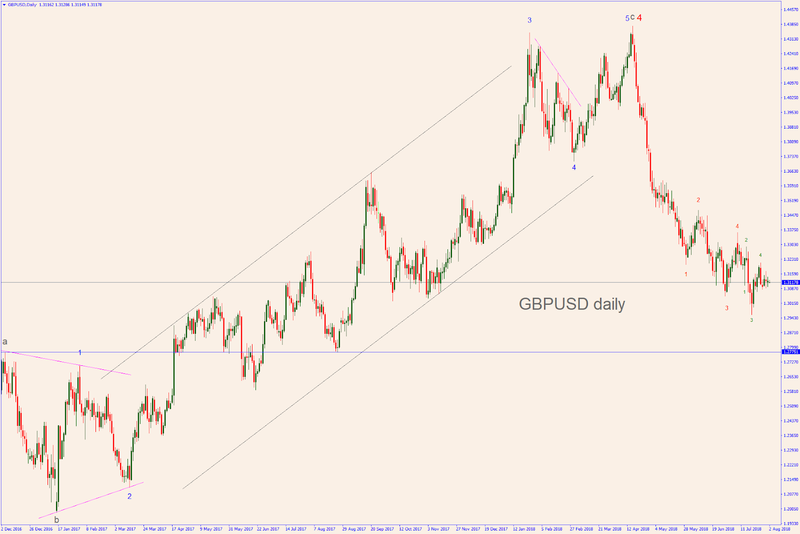 This could be a top as well. 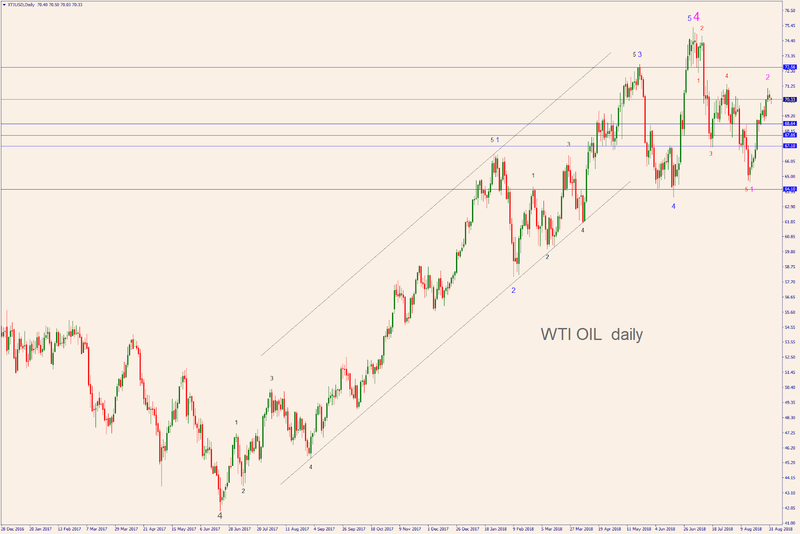 Most importantly, the daily chart clearly shows that the whole set of Elliott waves and sub-waves is religiously in place, confirming the assumption of the completion of major wave 4. 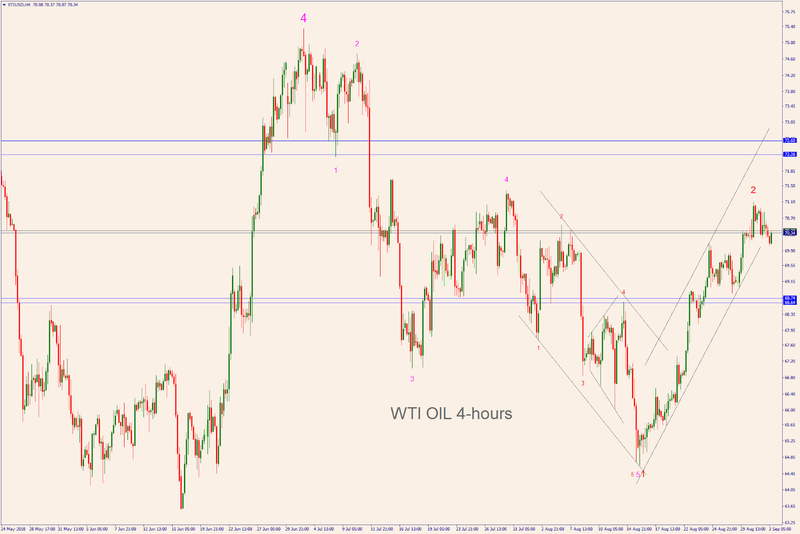 See also the possible target at 72.26-72.60. 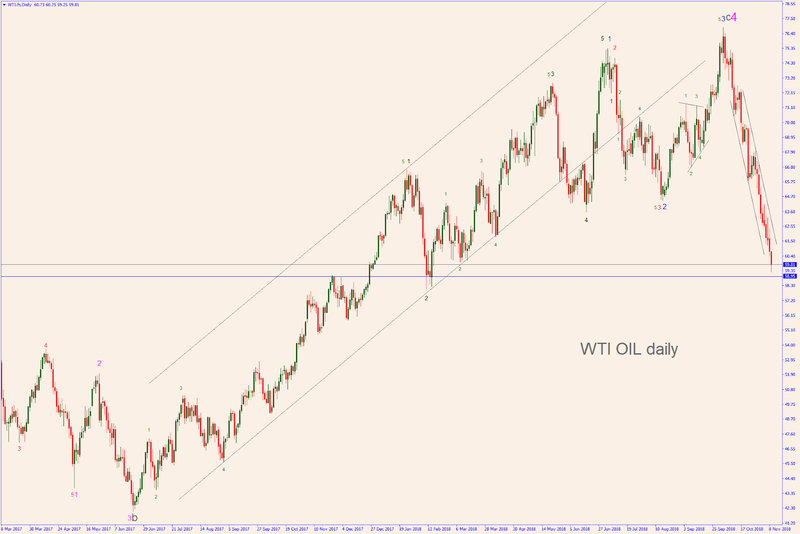 NOTE: W.D. 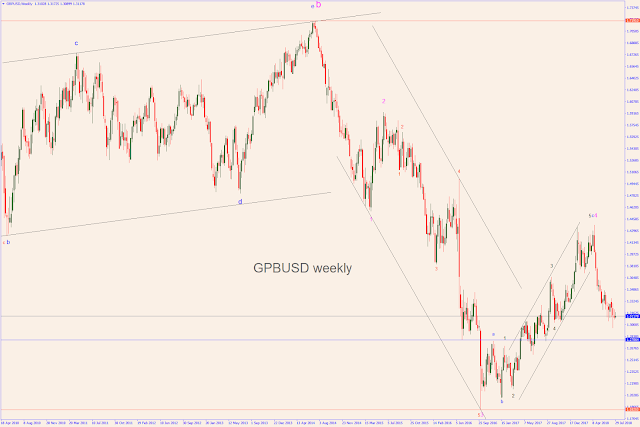 Gann - and very few others later - developed studies about the interaction between a price unit ($0.37) and a time unit (1 week) in order to pinpoint time turning points. Unfortunately I don't possess the knowledge and the technology to indulge in such a time consuming study. 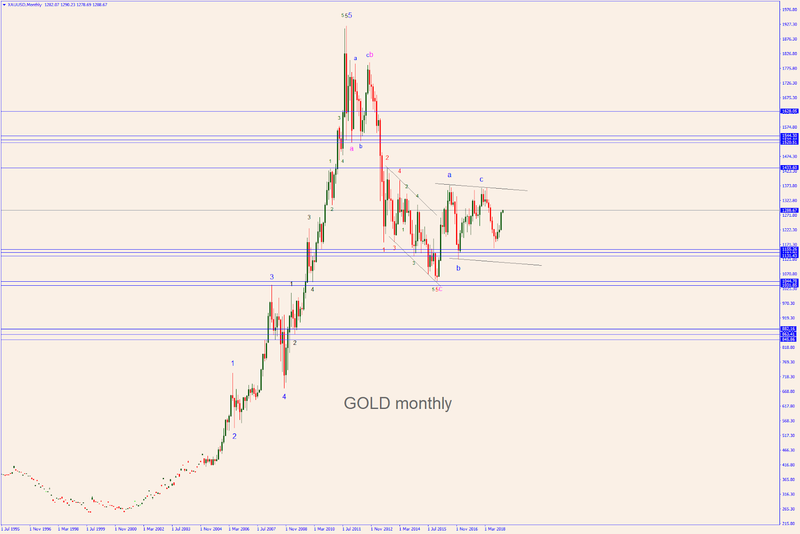 However, I sometimes use "Time Turning Points" as further confirmation of the Elliott waves events, like the contemporary completion of major wave 4 in conjunction with a TTP. Given that major wave 4 seems to be complete, the uptrend that started on Jan 20, 2016 appears to be over and the WTI OIL might soon head South. 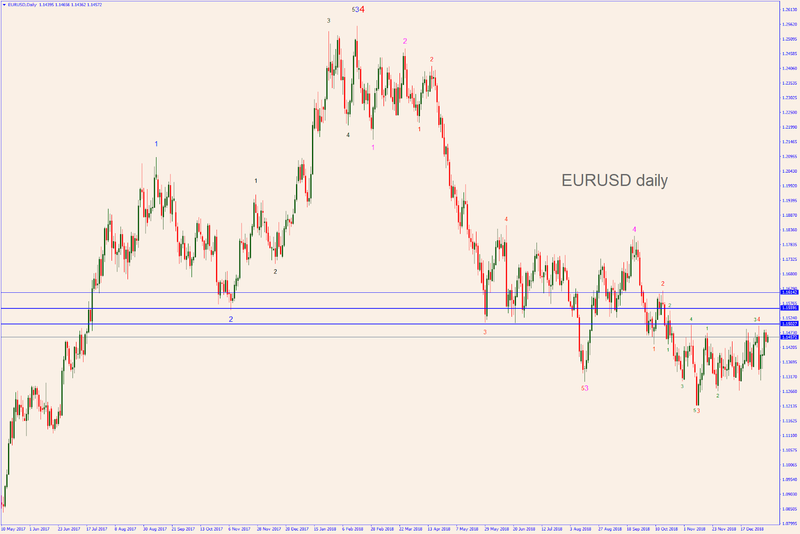 XAUUSD (now at 1184) bottomed at 1160 and started a new rally. Target 1235 and 1250. The identification of the Elliott Waves often poses some real challenges when it comes to some complex waves labelled by the purists "wyz-x-wyz". Hence, for the time being, I prefer to avoid that fancy stuff and stick to the hypothesis of a wedge formation, labelled 1-2-3-4. See the weekly chart. 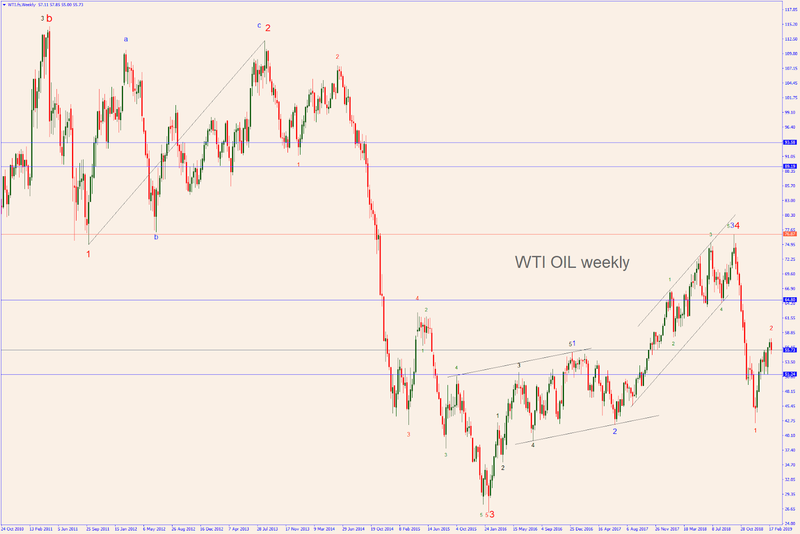 Whatever you choose to call it, this kind of pattern can lead to very contradictory outcomes in the very long run. Let's see how. 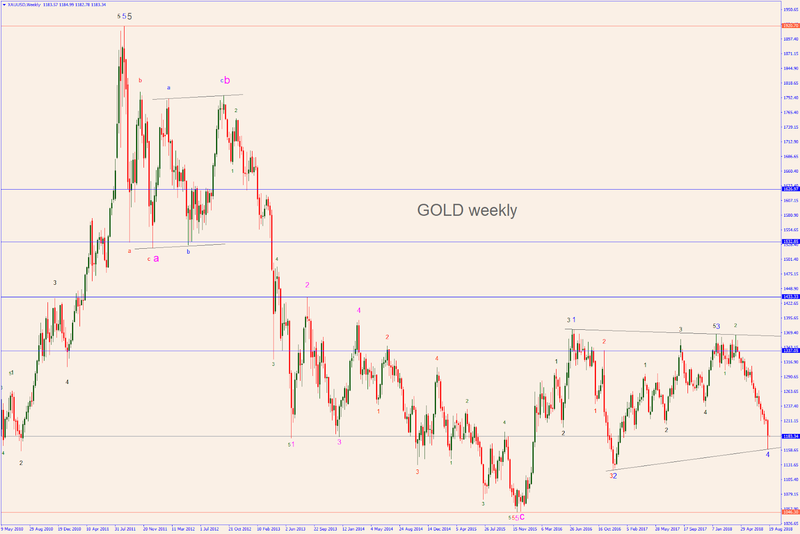 1) Gold might stage a fifth wave up (wave e) with a "throw over" to the area 1433-1627 (see the weekly chart). 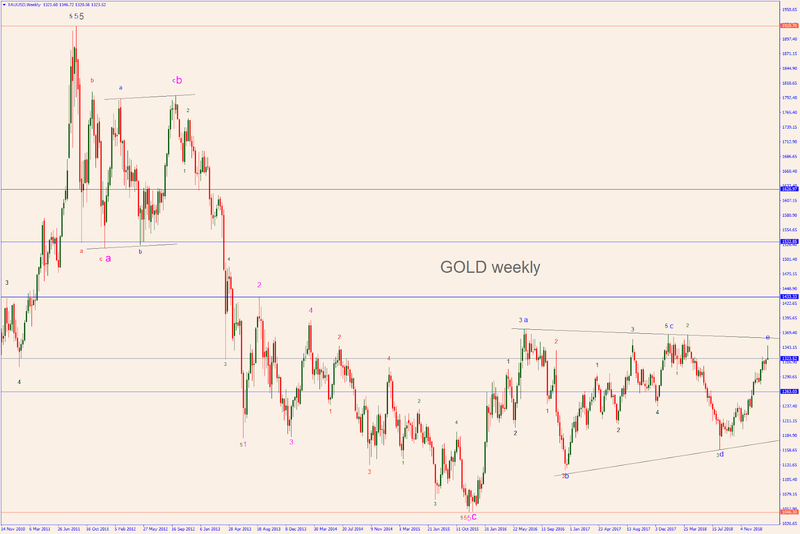 3) Finally, if the pattern on show right now is not a wedge (a-b-c-d) but just a simple a-b-c, there could be a temporary rally to 1235-1250 followed by a downtrend to the area 882-845. Whatever it happens, all these postulations have just one thing in common: Gold should reach the 1235-1250 area. 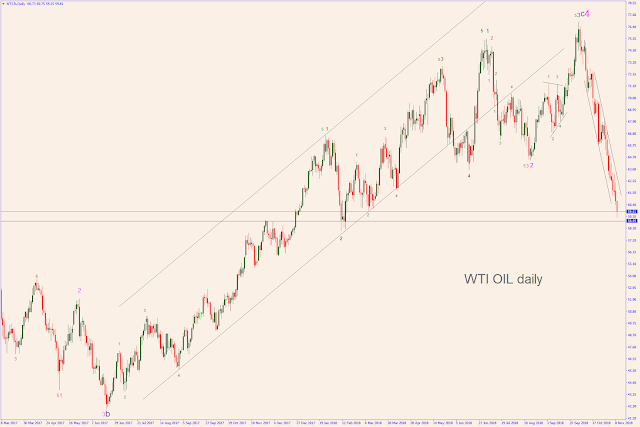 With the exception of the above targets, there are too many possible outcomes to be able to identify the most likely pattern in the long run. It is, therefore, wiser to stick to the close targets (see the 4-hours and the daily charts) and wait for more data. 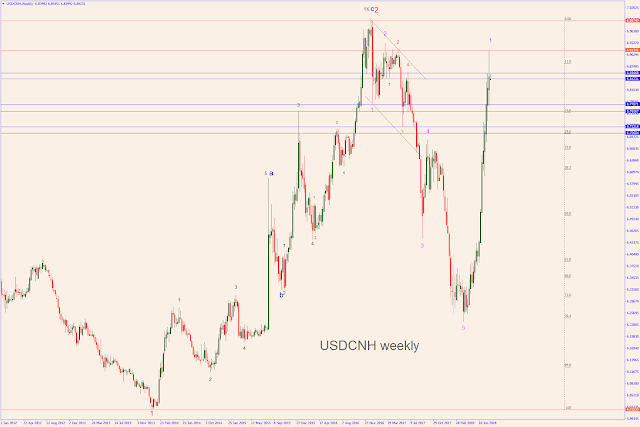 The USDCNH, (the inverse of Chinese Yuan), now at 6.83, topped and reversed the sharp rally started on March 27, as predicted in my previous post. Next target: 6.69. The weekly and the daily charts showes that the USDCNH staged a very sharp rally by means of a five-pattern-wave. Unfortunately, given the limited history of the USDCNH, there are not enough elements to predict the most likely long term wave pattern. 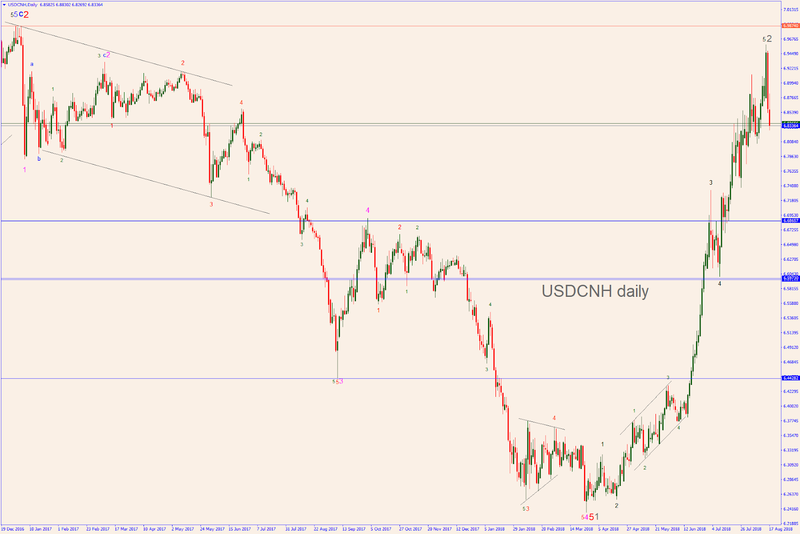 At present, the only direction seems to be down and the most likely targets seem to be 6.686 and 6.60. 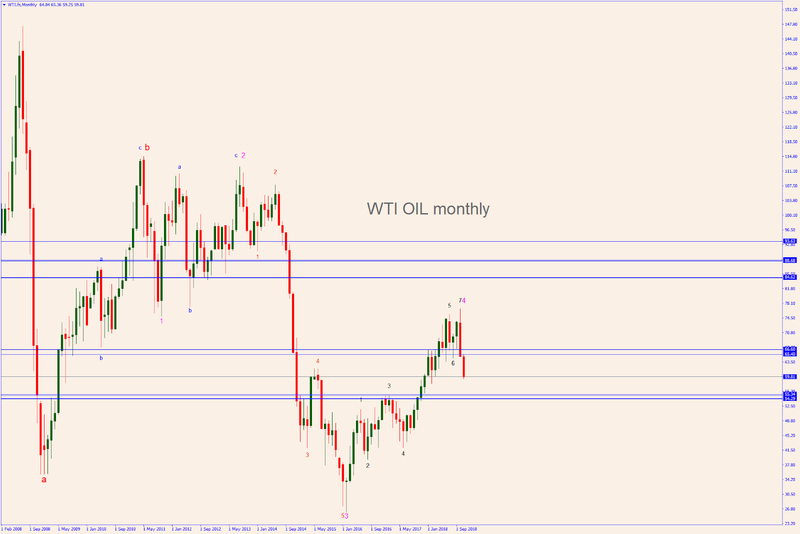 See the blue horizontal lines in the daily chart. The 4-hours chart shows the big reversal pattern and all the other waves of lower degree. 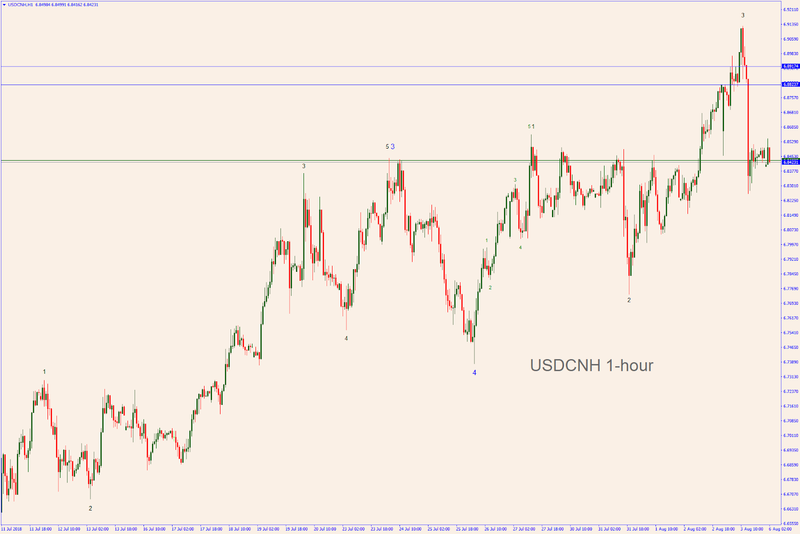 The USDCNH to top soon? 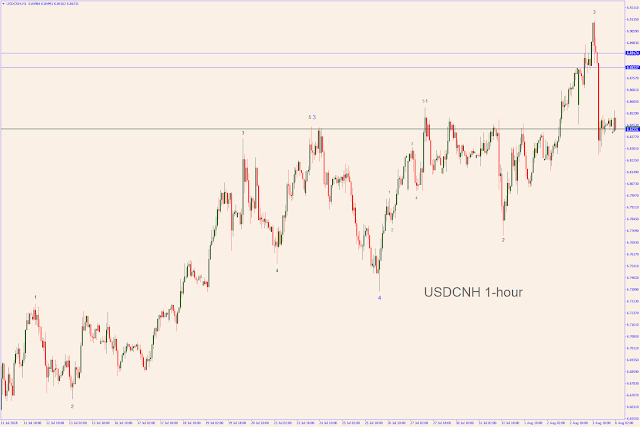 The USDCNH, (the inverse of Chinese Yuan), now at 6.84, has reached the target area at 6.86-6.92 where it stopped and reversed the sharp rally started on March 27, at least temporarily. The weekly and the daily charts show that the USDCNH has reached the target area (the blue horizontal lines) where it was expected to top. However, this might not be the "big reverse" that the Elliott Wave people are waiting for. 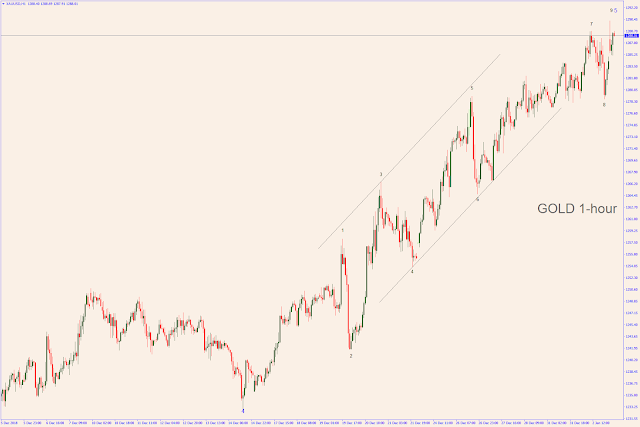 In fact, the wave count looks incomplete and it might not be final. The 4-hours chart shows a big reversal candlestick and the 1-hour chart shows that, although it could bounce back to 6.88, the Yuan is actually ready to resume the new downtrend. The GBPUSD (now at 1.31182) shows extreme weakness and should resume the downtrend to 1.30. The monthly and weekly charts show that the Pound is unfolding "major wave five" (downward) with a very long term target below 1.18. The daily, 4-hours and 1-hour charts reveal that we are witnessing the last leg of the very minor wave 5 (downward) that should take the Pound to 1.30.